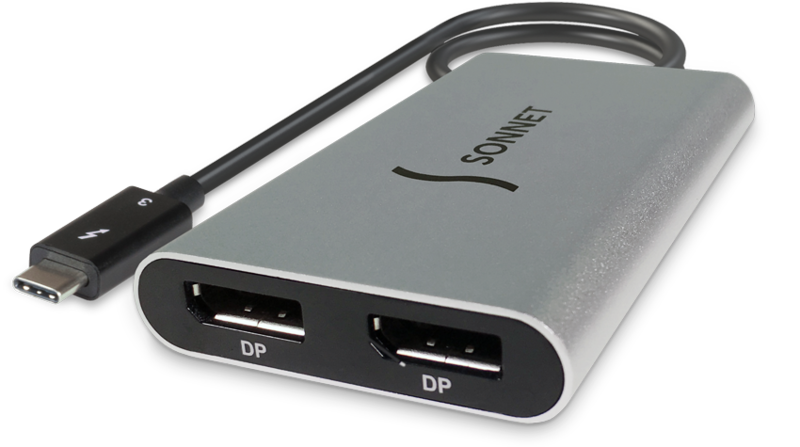 Sonnet’s Thunderbolt™ 3 to Dual DisplayPort Adapter is certified for use with both Mac® and Windows® Thunderbolt 3 equipped computers, and enables you to connect one or two larger displays to a single Thunderbolt 3 port on your computer. With the adapter connected, you can connect up to two 4K @ 60Hz DisplayPort (DP) monitors, or one 5K @ 60Hz DP monitor. Although Sonnet’s Thunderbolt 3 to Dual DisplayPort Adapter supports the connection of up to two 4K monitor or one 5K monitor with 60Hz refresh rates, the actual number of monitors it will support, as well as the screen refresh rates, are determined by your computer. Click here to view a list of Thunderbolt 3 hosts (computers) and their capabilities; please note that at any given time this list may not be complete. Click the appropriate Filter by Brand/OEM link, and then find your computer model. Check the center column to identify its external display support capabilities. If your model is not listed, contact your computer’s manufacturer for information. If “Dual 4K@60Hz” is listed, your computer will also support a 5K monitor @ 60Hz. 5120 × 2880 (5K) resolution support requires the connection of both adapter ports to a compatible 5K monitor’s DP ports using DP cables (sold separately).